A long, wild, and wooly chase day. Things started pretty slowly as we hung around the hotel until well after noon and had lunch. 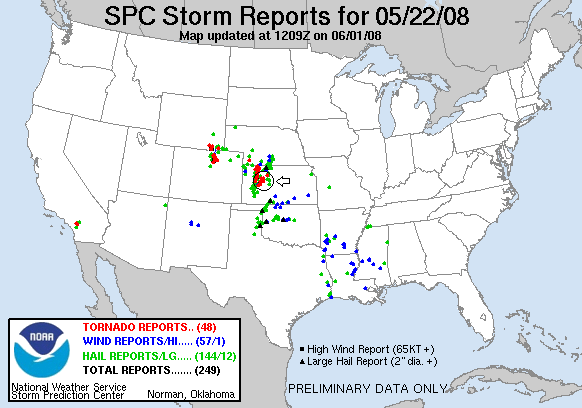 Then, all at once the dry line exploded from Dodge City all the way up to Colby. The better cells were to the south so we began our strategy of intercepting the storms then staying with them until they crossed the warm front to the north. 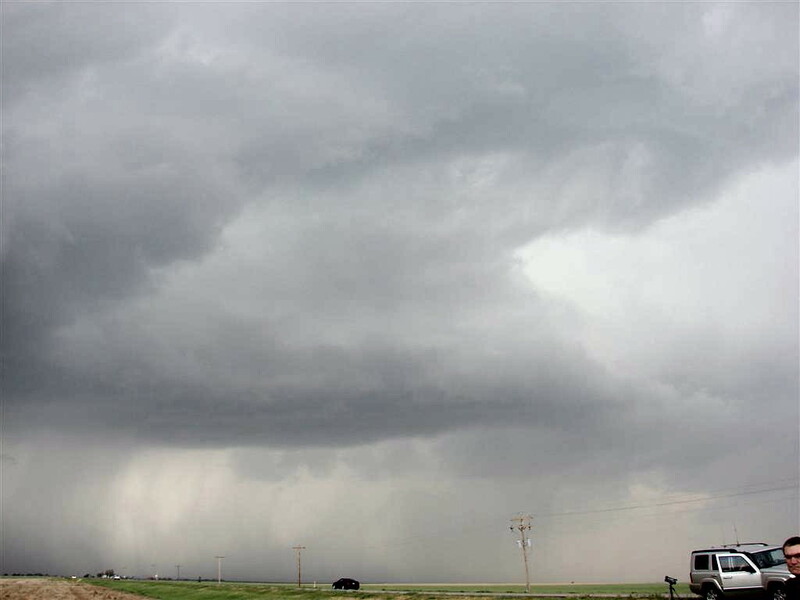 Our first storm was intercepted north of Scott City, and though it had a nice looking wall cloud with vivid rotation (every storm today was spinning like crazy), we proceeded south to the next, more intense cell lest we get cut off in the extremely limited road network. The southern storm was interesting but wasn't quite ready to do it's thing so we had to follow it north. To do so, we had to get to the east and to the only north-south option, which we did but that put us quite a way away from the storm. Ultimately, we followed it all the way back to I-70 and north of it. By the way, I should digress and mention that the chase convergence today was outrageous. They were everywhere, in every possible pull over, at every turn. We ultimately blew off this northern storm to target another storm that was right moving relative to the northbound flow of the day. We had to hurry to beat the storm to Dighton, as again we were at risk of being cut off. We paused on the way down to observe another cell with a clearly rotating wall cloud, but soon left it to head for our much beefier target storm. We intercepted our next cell near Shields and were greeted with a large block of a wall cloud with rapid cascading rotation. 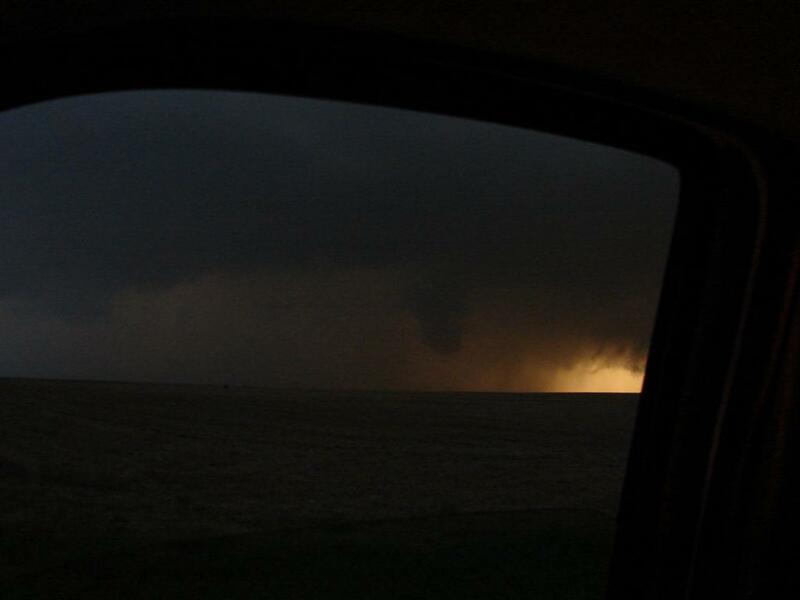 At one point we had to evacuate our vantage point because a spinup occurred practically right on top of us. Roger at one point believed he saw a rain wrapped tornado before we had to pull out, but I couldn't see it. We stayed at the gas station there for at least an hour, sending the guests off to eat dinner and watching as a violent HP storm sailed by to our west. 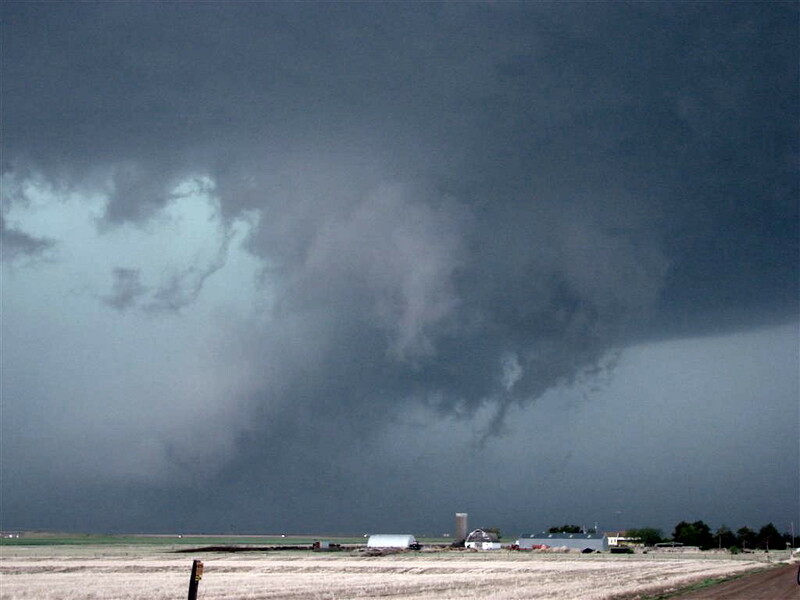 Then, Roger noted that there was a storm with a confirmed tornado on the ground heading for Wakeeney, and we went after it, beating it to Wakeeney by probably 20 minutes or so and heading south to get to the east side of the updraft. We quickly saw a very low wall cloud and after a few minutes it produced a brief elephant trunk tornado not far to our south. The tornado quickly became rain-wrapped and we ran to the north, suspecting that there might be a much larger tornado developing in the rain. We made it to the highway and bolted east, but as soon as we got to the highway, we saw that the RFD had surged ahead incredibly (almost logic defying) fast and Roger screamed into the radio "Get ready for a major a$$ kicking!!" Within a minute of that, it was all over us, blasting us with 80 or more MPH wind that nearly launched the lead van right off the highway when it first hit. The very first hail stone that hit my van nailed my passenger side wiper, twirling it like a board game spinner until it came to a stop backwards and inoperable. I was really lucky that it wasn't the driver side wiper. We got absolutely pummeled for about 5 minutes with golf ball hail, heavy winds, and blinding rain. There was a lot of screaming on the radio about stopping, but Roger answered that there was probably a major rain wrapped tornado in our immediate vicinity so stopping was not an option. Finally, we escaped the core and watched the storm move off to the north. After taking a few minutes to regroup, we got back on the interstate heading west for the hotel, getting more hail from the next (and last) core in the line. As we passed Wakeeney, we could see a number of emergency vehicles around town and wondered if it had taken a tornado hit or at least straight-line damage. When we'd gotten one exit west of town, the last cell in the line got tornado warned and had a TVS indicator on radar, so we headed back to Wakeeney to chase it, even though it was now after dark. Passing through Wakeeney, our suspicions were confirmed: The north side of town definitely took a tornado hit. We noted many downed large trees, business signs knocked down, and a large storage building that apparently had been filled with wood completely destroyed and much of it distributed into the road. We got north of town and eventually stopped and watched the storm as it headed off north, so completely illuminated with lightning that we could easily make out the cloud structure and massive block wall cloud. Eventually we headed back to the hotel, making one more lightning stop on the way. An exhausting and adrenaline-pumping day, filled with the depths of despair and then success. Sadly, I didn't get much in the way of pictures of the tornado because I was on the wrong side of the van, and because we were in such a high lightning threat that I didn't want to get out of the van (we were repeatedly getting CG's within a mile of the van, close enough that you got the BANG!!! kind of thunder rather than a rumble). We returned back to the same hotel we'd stayed at the night before in Colby after making a big zig-zagging circle of 383 miles. 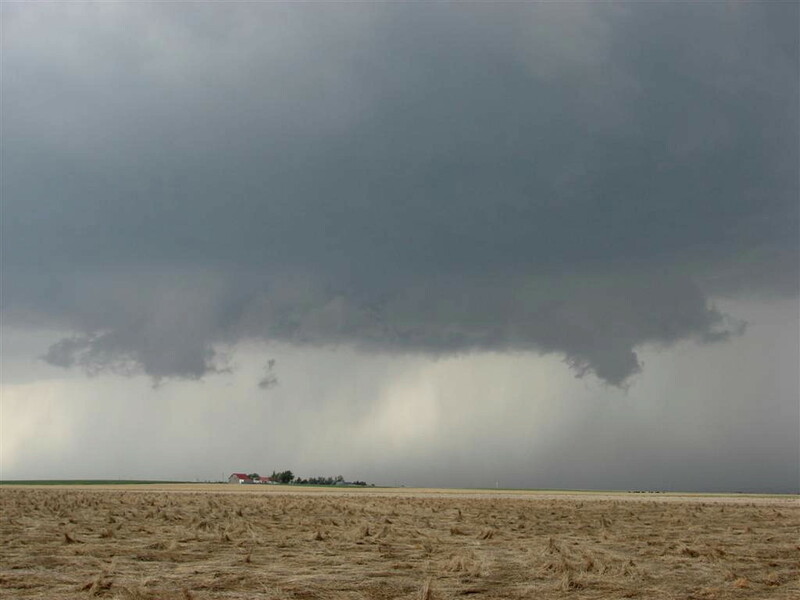 Near Healy, KS, a lowering develops on the first storm of the day. Rain free base of another of the early storms. Developing wall cloud with hail core behind it near Utica, KS. A flat seemed to end our day, but the day is not done! A storm coming straight towards us from the south becomes tornado warned. We head south out of Wakeeney where the storm generates a low hanging wall cloud. Note also the funnel to the wall cloud's west. As the storm closed in on us, the lightning threat became EXTREME! Bolts were hitting within a few hundred yards every 30 seconds or so. Developing tornado! There were actually two on the ground at once but we had to turn the vans around to prepare for a quick escape so I ended up on the wrong side to take good video, and the lightning threat was so severe that there was no way I was getting out of the van to shoot. As the RFD wraps around you can still see the large funnel getting shrouded in rain. We got absolutely hammered by this core. The tornadoes that we saw hit the north side of the town, and we saw significant tree damage and a large storage shed completely destroyed. We headed north of town to watch the lightning show. Here, lightning illuminates a funnel cloud off to the north.